New York : W. W. Norton & Company, 2015. First ed. It was difficult to even begin writing this review; I'm surprisingly anxious about possible grammar errors. However, I figure if you just spotted my on-target use of the semicolon, I have you on my side already. Oh yeah, and maybe that hyphen, too. And that comma just now. I could go on ... ooh look, an ellipsis! Here's the takeaway: "who" does not change to "whom" just because it is in the middle of a sentence. The choice of "who" or "whom" is governed not by its role as the object of the sentence or the object of a preposition but by its role in the group of words that has been plugged into that position. ... "who" and "whom" are standing in for a pronoun: "who" stands in for "he, she, they, I, we"; "whom" stands in for "him, her, them, me, us." The haters hate this book so much that I feel compelled to warn those of you who may be the type to walk into a movie, for example, without ever having read a review or considered the intended audience: apparently such people exist. You must be interested in English usage to enjoy this book. You should have read the New Yorker magazine at least once or twice without having broken out in hives. You probably shouldn't be the kind of person who thinks that "elitism" is a constant affront to you. Is the author elitist? Maybe. I don't know. She has standards. It's her job to have them and to enforce them. I don't think she mentions Dan Brown or Danielle Steele in her book, but if you think those authors are good writers, you might think that Mary Norris is an awful elitist. I guess I am one too. Ms. Norris spent a long time as a copy writer for The New Yorker. Here she shares some of her opinions on grammar and punctuation as well as anecdotes about authors with whom she worked. It’s a slim book and would have been better if it were several times its actual length. Still, what is there is fun to read if you like this sort of thing (I do). It was interesting to see how copy editors, even those working together on the same, stringent magazine, do not always agree on what the rules should be. It was fun to watch how they would struggle to discard their rules in order to protect the voice of a talented author…and even more fun to watch them try to guide an author who thought himself talented when he was only slightly illiterate. I must have missed the memo: this isn't a book about the English language as much as it is a memoir of a copy-editor's relationship with the English language throughout the course of her tenure at the New Yorker (which would have been fine if I was interested in that sort of thing). I didn't find it funny, educational, or endearing. I didn't even find it organized or consistent, let alone engaging. It felt trifling at best, stifling and elitist at worst (only poetry and classics are allowed to be creative, all other attempts are scorned; Americans aren't proper enough or intellectual enough to be allowed the use of the semicolon). Often she would make a blanket statement about proper punctuation usage, only to follow it with an example of a renowned author doing the opposite with great success. I nearly quit reading multiple times, but pushed through...it was only 200 pages, and I spent hardcover prices on it for goodness' sake. I'm sure all of my erroneous punctuation here would make her cringe, and this thought, at least, provides me with a moment's joy. Entertaining, fascinating and thought provoking. This is a funny and enlightening book about grammar by Norris who worked for over three decades in the copy department of the New Yorker. It will not interest everyone, but for those who are intrigued with the history of hyphens, commas, and the future of apostrophes – this one is for you. The book is interesting with lots of details about punctuation and such. There is a chapter on the use of profanity and one on pencils and pencil sharpeners. Lots of humor and details of the author's work as a copy editor are sprinkled in. This is not a page turner, but was interesting enough that by the time I thought about quitting, I was half-way through. This book is for people who want to know what a copy editor does and can appreciate the fun Norris has with the problems a copy editor faces. Someone really good with the English language might appreciate this book more than I who has a moderate command of English and no experience writing or editing books or magazine articles. I am a complete grammar nerd; I just love grammar. My children don't want to let me read their papers because they know that they won't just get corrections, they will get explanations for the corrections. They are not grammar nerds, and they do not appreciate my teachable moments. This drives me nuts (although my dad contends that it's not a drive; it's a short putt). If I can't influence their writing, at least I seem to have had an impact on their speaking. Maybe someday they'll let me look at their papers too. 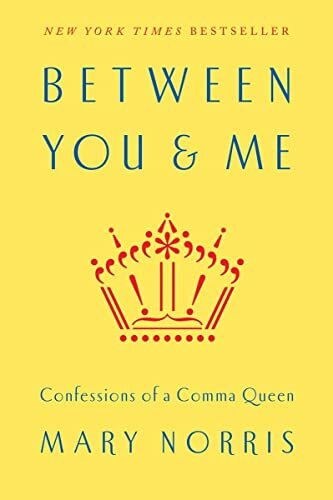 I doubt it, but in the meantime, I can at least feed my inner grammar nerd by reading books like Mary Norris' Between You and Me: Confessions of a Comma Queen to get my fix. For over three decades, Mary Norris has wielded her pencil as a “Comma Queen” for The New Yorker. In this cross between memoir and guidebook, Norris takes readers through her years at The New Yorker while highlighting some of the most important grammar lessons she learned along the way. For me, the book’s highlight was Norris’s discussion of authors who refused to have their grammar corrected in order to protect their voice. She shares examples from authors like James Salter and George Saunders, which makes for a fascinating look at how grammar rules can bend to create beautifully crafted sentences. I really enjoyed this book. It's kind of all-over-the-place; part memoir, part history, part usage guide. If you're just looking for clear rules of usage and punctuation, look elsewhere, but if you can't digest that stuff in large chunks (I know I can't) this is a good place to start. I feel that I got a better grasp on what the heck a semi-colon is for, and the difference between a hyphen and a dash, and why I never hear about n-dashes, though m-dashes are all over the place. I especially appreciated the chapter in which the author wrestles with the problem of gender in the English language, specifically the lack of a good, widely accepted non-gendered third-person pronoun. She fumbled with pronoun changes when her brother announced his->her new identity as a woman. I don't have anyone that close to me going through gender-ambiguous territory, but I do know some more casually, and I've found it a bit disorienting, linguistically. I've become more and more interested in language and grammar over the past few years, probably in part because I've been writing more online and I don't want to embarrass myself. Living in Australia has something to do with it too, as I find myself defending why Americans talk or write the way they do, and I like to be armed with facts. Between You & Me was a Christmas gift, and I was expecting, from promotional blurbs, a book with a similar tone to Eats, Shoots & Leaves by Lynn Truss. It's not; the humour here is...negligible. Or maybe just different. As much as this book is about grammar and usage, it's also a memoir of sorts of Norris' time at The New Yorker. I was thrilled to learn that I can let go of the guilt I feel for using hyphens instead of proper em/en dashes, because it's an acceptable substitution, given a hyphen is easier to reach on the keyboard. I was also happy to learn I wasn't abusing my dash usage - they're so useful! But it turns out that using semi-colons is considered pretentious (in America anyway). Bummer; I guess that means I'm pretentious? They just seem to be the natural punctuation for how I write. I try to keep them to a minimum, but I do like stringing together a couple of independent clauses. Part memoir, part English usage guide, and very humorous. Believe it or not, I have a collection of The New Yorker magazine dating back to the early 1970s. An English teacher I had in high school, recommended that I read the magazine to learn about all sorts of writing, and when I bought my first copy, it had a story by John Updike. This worm on a hook captured me, and I began my first “author obsession.” John Updike is gone, but I still read every issue nearly cover to cover. When I heard of a book by a copy editor at the magazine, I could not resist adding to the lore of the fabled magazine now in its 92nd year. In Between You & Me, Mary Norris—aka the Comma Queen—has written a thoroughly enjoyable tale of her adventures working for the pre-eminent magazine published today. In a chapter titled “Spelling is for Weirdos,” she writes, “The English language is full of words that are just waiting to be misspelled, and the world is full of sticklers, ready to pounce. Ours is not a phonetic language, like Italian and Spanish and Modern Greek, where certain letters and combinations of letter can be relied on to produce consistent sounds. English has many silent letters. And its motley origins make it fiendishly difficult to untangle. Besides the Germanic roots of our Anglo-Saxon tongue and the influence of Latin (Emperor Hadrian) and French (the Norman Invasion), and borrowings from Greek and Italian and Portuguese and even a soupçon of Basque, American English has a lot of Dutch from early settlers in the East; plenty of Spanish, from the conquistadors and missionaries who explored the West; and a huge vocabulary of place-names from Native American languages, often blended with French, for added confusion” (17). We native speakers of English treat our language as though it was a simple matter, but even good students can get tangled in is many webs vines. But my favorite chapter is “Ballad of a Pencil Junkie.” I love writing with pencils much more than pens. Every room has a discarded mug filled with pencils, which outnumber pens by at least 4-to-1. Norris writes, “In the old days, at The New Yorker, when your pencil point got dull, you just tossed it aside and picked up a new one. There was an office boy who came around in the morning with a tray of freshly sharpened wooden pencils. And they were nice long ones—no stubs. The boy held out his tray of pencils, and you scooped up a quiver of them. It sounds like something out of a dream! Even then I think I knew that the office boy and his tray would go the way of the ivory-billed woodpecker” (171). Oh how warm and fuzzy it is to know there are others who share this innocuous obsession. Norris has a preference for No. 1 pencils. I have never used one—I prefer a sturdy German mechanical pencil for my pocket. No. 2s are for all other tasks. Norris writes, “Writing with a No. 2 pencil made me feel as if I had a hangover. It created a distance between my hand and my brain, put me at a remove from the surface of the paper I was writing on. I would throw it into a drawer” (172). Mary also made an excursion to The Paul A. Johnson Pencil Sharpener Museum in Ohio. The museum boasts 3,441 pencil sharpeners. The rules for admission to this august temple of pencildom were set down by the founder. “each pencil sharpener had to be unique—no duplicates” however, “it could mean a sharpener was the same shape but a different color, or highly polished instead of dull” (180). After completing her visit, Mary “went back to my car, found the pencil sharpener just where I had packed it, in a pocket of the zippered compartment on my backpack, and photographed it on the back of my car before shaking out all the shavings in the parking lot. I did not want the fact that my sharpener was not a virgin to make it ineligible for display in the museum” (191). Mary Norris’s delightful story, Between You Me: Confessions of a Comma Queen, is an antidote to all the other dark things we read, hear on the news, or read in the papers, I am not a serious punctuation freak—outside of an English Composition class—but I do enjoy catching an errant apostrophe here and there. 5 No. 2 Pencils! A New Yorker magazine copy editor writes of grammar and punctuation puzzles, magazine policy and eccentric colleagues. This book—part history of language, part grammarians’ bible, part punctilious punctuation-snob puncturer—by a veteran New Yorker copy editor attempts to explain why writers in English, particularly those whose work appears in The New Yorker, make the choices they do. Form, not content, is her subject. While that publication is notoriously picky about copy matters, Norris’s anecdote-rich text suggests how much elasticity actually exists within its seemingly constricting rules. Norris took her title from the common grammar mistake people make in using “I” when “me” is required. I yell at the radio when I hear the awful “between you and I” or “He invited Tom and I . . .” I suspect Norris does too.Several chapters cover the ongoing punctuation wars. No surprise, as the subtitle of the book is Confessions of a Comma Queen. In the comma skirmish, I find I fight on the side of “playing by ear,” dropping in a comma where I sense a pause. And in hyphen disputes, her emphasis on clarity of meaning seems a useful approach. Thus the comma in milk-truck driver above. Some of the text on verbs got away from me and her suggestion for how to tell whether a sentence needs “who” or “whom” (for the straggling soldiers in that lost battle), her system was overly complex or not explained clearly. I’ll stick with mine.